This Hawk set is a wrinkle from the Cleveland Cavaliers “Hawk Stagger” action when X2 denies 2 cutting to the basket off of the back screen. Instead of 2 cutting off of the weakside stagger screen from 4 & 5, he sets a double ball-screen with 3 for 1. 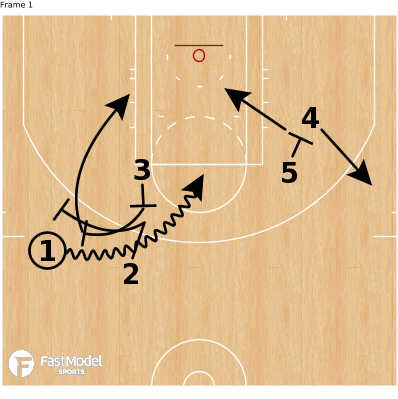 As 1 attacks off of the ball screen, 3 rolls to the short corner and 5 sets a down screen for 4 as X5 is zoning up to help on the penetration and roll. 1 has option driving it to the basket, passing to 3 on the roll, 2 “shaking” behind 3’s roll or drive-and-kick to 4 (Kevin Love) exiting to the wing.